I took these pictures on my wife's and I anniversary dinner back in February when we went to La Caille restaurant, which is often regarded as the most expensive restaurant in Salt Lake City. And going there again for a Mother's Day Sunday Brunch reminded me that I had them so I figured I would post them. Sorry for the blurriness, I took them with my phone. But I think that it is great that they played off of their expensiveness with the first one. 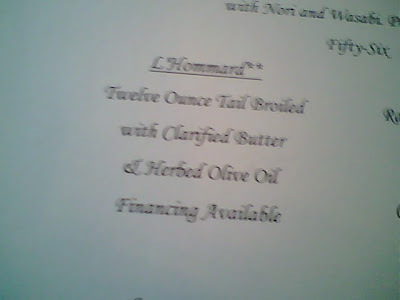 It may be difficult to read but all the menu items had a price spelled out (i.e. Fifty-Two Dollars instead of $52). So when we came across this one we weren't sure if they were serious or not (it states Financing Available). They were rather humorous about it though and the waitress confirmed that it was indeed a joke. 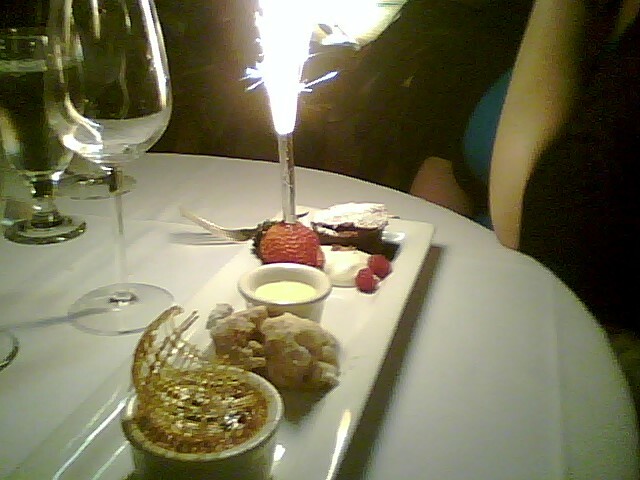 Plus for our anniversary they gave us this firecracker candle with our desert, which really made it special. Finished up the semester. Nothing else really big happening. Just trying to tie some ends up from the semester before I can move on.